Although I enjoyed The bookshop I much preferred Offshore. It’s interesting, isn’t it – lots of readers love Penelope Fitzgerald’s work, but almost everyone seems to have a different set of favourites! I enjoyed Offshore a great deal, just not quite as much as The Bookshop. I loved this book when I read it a few years ago. The thing that stood out for me was the remarkable sense of place she evokes: the Thames really comes alive in these pages. Yes, the sense of place is wonderful – you really feel as though you’re there on the river with these characters. I love the way Fitzgerald draws on her own personal experience for inspiration and authenticity. Right, I’m off to read your review of this novel now! I wonder if it’s something to do with the order in which you read the books. I much much preferred Offshore which I read long before The Bookshop. The Bookshop felt to me like Fitzgerald just limbering up. I’m a late arrival too, and I do like the sound of this. I can definitely recommend it. In fact, all three of the Fitzgeralds I’ve reviewed are very, very good indeed. I don’t know why it’s taken me so long to discover her. What a lovely review – really whets the appetite! It’s time I reacquainted myself with Fitzgerald. I went through a period of reading her lots in my twenties, but to my shame I’ve even forgotten some of the titles. I do remember reading Offshore, simply because of the setting and subject matter being quite unique. Thanks, Marina. I can imagine any of these three novels standing up to a reread. They’re quite subtle, and the writing is so good that I’m sure you’d get more from a second shot. I was attracted to Offshore’s setting and subject matter as well. My father owned a little boat, so we spent many a weekend on the river when I was a young girl. I really enjoyed the Bookshop but Offshore seemed bland in comparison. I really liked the characters, the use of humour and the clear sense of place in Offshore. The plot does take a bit of a back seat, though – I preferred the storyline in The Bookshop. That said, I did enjoy Offshore a great deal. Did you review it, Guy? I’ll take a look over at yours in a little while. I am liking books that are not plot driven more and more. Stories told within communities like this one are common, but the nature of one consisting of houseboats makes this sound unique and sound like it provides some interesting dramatic and possibly symbolic opportunities. Fitzgerald’s very good when it comes to portraying these small, self-contained communities – it’s a feature of both Offshore and The Bookshop. And you’re right, the setting in Offshore gives it a very distinctive feel. It’s just perfect for all manner of developments – dramatic and humourous! Well, anything that’s compared favourably to Mike Leigh’s work is worth investigating. This one sounds more appealing than others I’ve heard about but I think The Bookshop is at my local library, so that may be my first one. Mike Leigh’s films were the closest reference point I could think of. There’s a similar combination of humour and tragedy here, and I could just imagine some of these characters popping up in his work. 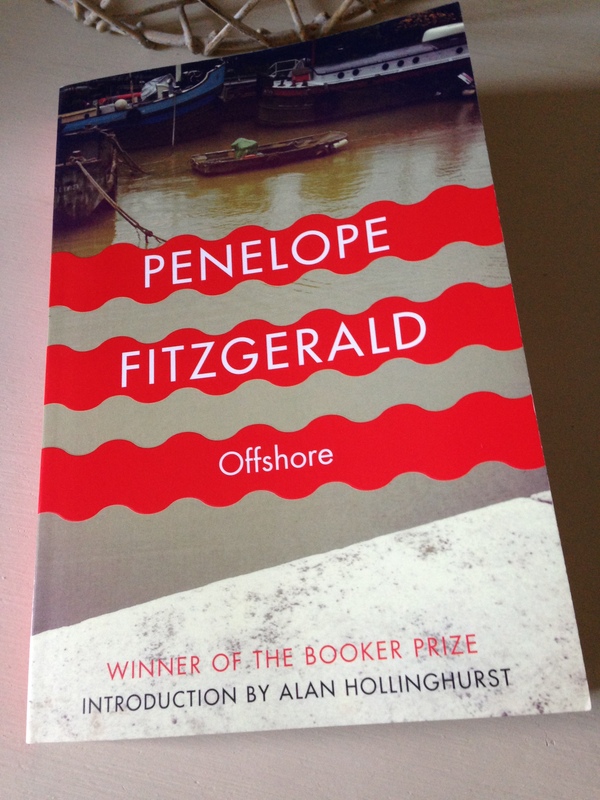 As for Fitzgerald, The Bookshop’s great and Offshore is right up there too – I don’t think you can go wrong with either of them! I fall into the group that didn’t love it. I enjoyed part of it ( as others have said the evocation of the Thames life was good) but overall I was underwhelmed. It’s interesting to see the range of views on this novel – I’m sorry it fell short of your expectations, though. What did you find disappointing about it? Was it the low-key nature of the plot or the characters? I think it was the plot in the main Jacqui. Shameful confession: I’ve never read any of Penelope Fitzgerald’s work. No shame in that at all – we can’t read every author! I noticed a conversation on Twitter the other day in which someone tweeted “Be proud of what you have read, not ashamed of what you haven’t.” There’s something to be said for that. Ooh, The Blue Flower – I have it on my shelf. Historical fiction is not my favourite genre, but I’ve taken a chance on this as Fitzgerald’s such a great writer! It’ll be interesting to see how I get on with it – glad to hear you enjoyed it so much. It’s funny you should mention The Blue Flower as, having never read Fitzgerald, that was one I’d thought of starting with. Having read all the comments, though, The Bookshop seems to be the favourite! Well, I would definitely encourage you to read Fitzgerald. I think she’s a brilliant writer – very insightful and precise. As for which one to try first, The Bookshop would be a good option – it was her second novel, so you’d be starting near the beginning. And, as you say, other readers have enjoyed it! I’ve only read The Blue Flower, and one of these days must get to the others. This sounds like a good candidate. I always wanted to live on a boat or a barge – for a little while. Living on a barge does sound fun. Well, certainly in the summer months…winter might be a different matter altogether! It’s worth considering one one of Fitzgerald’s early novels, either this one or The Bookshop. I think she’s excellent on these small, insular communities and the way little acts or occurrences seem to take on a much greater significance. I’m curious to see how I get on with The Blue Flower as historical fiction is not my favourite genre. It was going cheap in a closing-down sale, so I snapped it up. I’m hoping Fitzgerald’s writing will win me over. We have The Bookshop on our Book Club list, so I’ll start with this one. Thanks, Emma. I think Fitzgerald captures life on the houseboats very well – it’s almost as though you’re there on the River Thames along with her characters. I really like the way she draws on her own personal experience in Offshore and The Bookshop – it seems to give these novels a strong sense of authenticity. The Mike Leigh comparison is an interesting one. I can see that. I’m not however a huge Mike Leigh fan (which I shouldn’t say online – I think that counts as an automatic fail on the UK Citizenship Test) which may be why I liked this but don’t now recall it as one I love. How did you find the depiction of the children? I found them a bit too precocious to be entirely credible. Admittedly in part they’re a Greek chorus commenting on the adults, but they’re also presented as characters in their own right and I’m not sure they work as well as the adults. Fitzgerald’s kids are strange creatures, aren’t they? Oddly enough, I thought Martha and Tilda were a little more believable than the children in the other two Fitzgerald novels I’ve read so far. (I’m thinking of the eldest child in The Beginning of Spring and the young girl in The Bookshop, neither of you’ll have encountered yet if I recall correctly.) I sort of bought the view that living on a barge would make Nenna’s girls super-resourceful as they probably had to fend for themselves to some extent. Plus they may have spent more time with adults than with other children, especially seeing as they weren’t attending school very regularly. I do know what you mean, though, as they are rather mature for their age, Martha in particular. And returning to The Beginning of Spring for a sec, Dolly (aged ten) is a very knowing child, almost like a little adult in her observations and speech. I’m quite curious to read At Freddie’s at some point – it’s set in stage school, so I can imagine those kids might be even more precocious than the ones on Offshore. I’m toying with the idea of reading the remainder of Fitzgerald’s novels in order – if so, At Freddie’s would be next but one in the sequence.